When squirrels live in an attic, they have to go in and out several times each day, to forage for food and water. They key to trapping them is to find their entry and exit hole. If they have several holes, find the most commonly used spot, and seal off every other area. Once you have it down to one hole, you can set a repeater trap or one-way exclusion door. In this case, I've mounted a one-way door on the hole, leading into a larger cage area. The squirrels are able to exit through the one-way door, but then not able to get back in. This way, I catch all five squirrels in the attic at once! 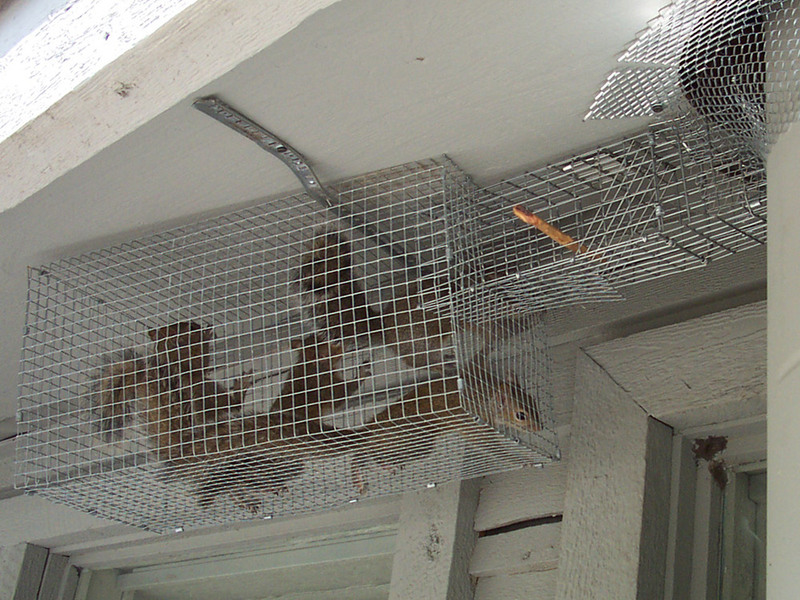 I set this trap at night, when I knew the squirrels were all inside the house, so I was sure to get them all. I wanted to catch them because this house had a lot of wood, and had I merely excluded the squirrels outside, they would have chewed their way back in. By trapping them all, I was able to relocate them to a new area several miles away.